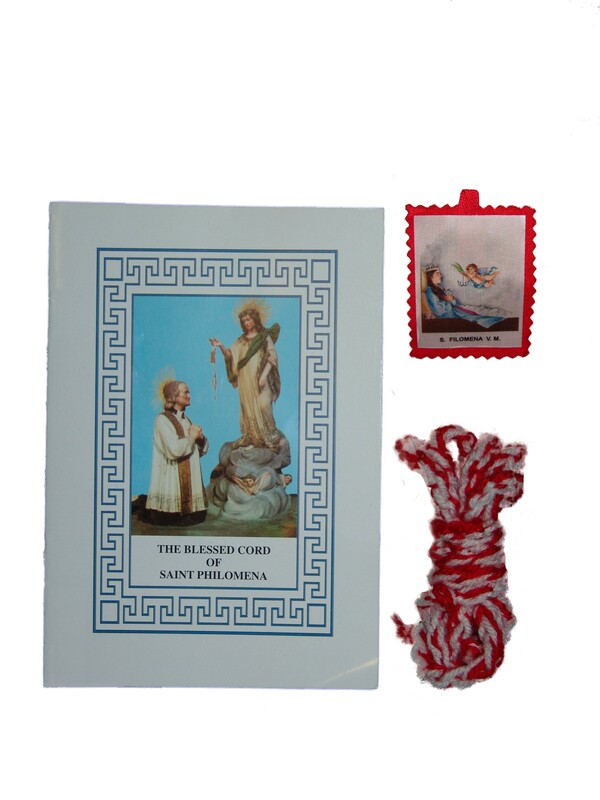 This pack contains: St. Philomena blessed waist cord, scapular and booklet with prayers on the cord of St Philomena. Good way to introduce friends to St Philomena along with bestowing on them a very traditional and blessed item of the devotion to St Philomena. Please note that the donation we request is to cover the cost of material used within this pack and shipping. This pious practice, born spontaneously with the Saint’s devotees, was approved by the Congregation of Rites on September 15, 1883. Later, on April 4, 1884, Leo XIII enriched it with precious indulgences. In this way, Saint Philomena will preserve, chaste and pure, safe from temptation, those who honor her virginal purity with this holy livery. Many steeped in the new rationalism of our days, find it hard to understand how a simple cord of thread can have the virtue of healing sickness of body and spirit. But these people are short on religious education, and do not realize that a Blessing from the Holy Church can deliver extraordinary virtues even to the simplest of souls. The hand of the blessing Priest, transmits to the substances healthy virtues for the body and the spirit, thanks to the merits of Jesus Christ’s Redemption. Saint Ignazio of Loyola, in his Exercises, insists on the necessity of having at heart all the observances approved by the Church, even if originated by popular devotions. Therefore, if the Church approves the devotion of the Blessed Cords in honor of the Saints, we can be sure, in practicing it, to be in right Faith and to accomplish meritorious actions. The Cord of Saint Philomena is made with threads of cotton or wool of white and red color. In one of the extremities it has two knots to remember the Virginity and Martyrdom of the Saint. This is worn under ordinary clothes like a belt. 3. profess a constant and a particular love to the Saint Thaumaturge, in order to merit her favors in the fight against sickness of the body and soul. 6. having the picture of Saint Philomena in our home, paying her a tribute of honor every day and, if possible, say the evening prayer, together, in front of her picture. Oh Saint Philomena Virgin and Martyr, pray for us, so that through your powerful intercession, we may receive the purity of spirit and heart, which leads to the perfect Love of God. Amen.